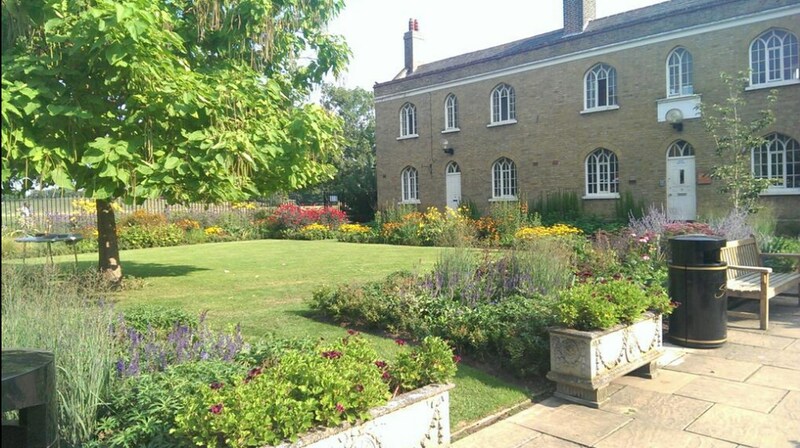 Chumleigh Gardens today provides a peaceful retreat with a multi-cultural garden established in 1995 to reflect the area’s diversity. Before welfare reforms in the 20th century, looking after the elderly and infirm was mainly carried out by local charities. Many of them established almshouses – groups of sheltered housing for local people like this one, the Female Friendly Society Asylum.The Female Friendly Society was started in 1802, by and for women, operating “by love, kindness, and absence of humbug”. It gave small grants to “poor, aged women of good character”. In 1821, the charity built its first ‘asylum’ here. There’s a copy of the dedication on a plaque on the central block. The almshouses offered modest bedsits to 20 residents, many in their 90s, affectionately dubbed “the old objects”. Expanded by the 1840s to the 3 buildings here now, the almshouses were damaged in WW2 and fell into disrepair. Thankfully they were saved from demolition during the creation of the park, and later renovated as ‘Chumleigh Gardens’ in 1981. The original charity has moved out, but its work continues to this day at its almshouses in Brixton.Listen to a 2002 Woman’s hour item about the Female Friendly Society. The multi-cultural garden, established in 1995, is a hidden gem. Designed to reflect the area’s diversity, Mediterranean, Islamic, Oriental, African & English gardens rest side by side. London sculptor Heather Burrell’s gate, marking a community & police partnership against hate crime, frames the Heart garden beyond, tended by those with recent or ongoing health issues. The gardens form a fittingly peaceful spot to commemorate local hero Kieb Thomas (1947-2007), inspirational community activist, volunteer, & teacher, devoted to ethnic & inter-faith harmony, justice and equality. 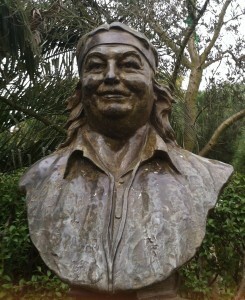 His bust in the Islamic garden depicts a great listener & story-teller, with his signature ‘beatnik’ look. There are hopes for a Kieb Street when the Aylesbury Estate is redeveloped. In the ‘English’ garden at the front, a recent plaque commemorates the dead of both world wars. The present park area suffered several major bombs, with consequent loss of life. This plaque partly also replaces an earlier plaque built into a wall near Calmington Street, commemorating a World War I Zeppelin bomb which demolished several houses and killed 10 in 1917. Calmington Street was finally fully incorporated into the park during the 2010 developments, so the original memorial was removed. Various plans have been made for the west block, and in the past, it’s provided additional space for 1st Place nursery. Along with the café in the north block and park offices in the south block, Chumleigh Gardens and the area round about is now the only remaining group of mixed industrial and residential buildings, which was typical of the area before the park was created. Today Chumleigh Gardens is a thriving space for the local community. 1st Place Children & Parents centre opened in 2005, and was born out of the Sure Start programme set up on the Aylesbury Estate in 1999. In the early stages, the centre was planned to be built beneath one of the blocks of flats on the Aylesbury estate, but following vigorous campaigning by local families, who wanted the children to experience their early learning in the green space of Burgess Park, the council agreed to build a new centre on the site of a council depot, formerly the R White’s headquarters. 1st Place is a charity which offers a wide range of free, open access play learning sessions, training for parents, as well as advice and family support services. There is a fantastic ‘beach’ with banana trees open to all younger children during the week and on Saturday mornings, as well a sensory room. Nearby Art in the Park aims to involve people of all ages and abilities in designing and making artwork at their studios and outdoor sites. It’s run by practicing artists who work with schools, community groups and professional teams on tailor-made educational art projects and training days. They also work with the public in creating permanent public artworks, some of which you can see as you walk around the park. Listen to people’s thoughts on Chumleigh Gardens here. Hello, can anyone help me, my great, great grandmother Emma Elizabeth Hose died in the Female Friendly Asylum in 1909, does anyone know if there is any further information I could get on her and does anybody know as to what age they were admitted to the Asylum. I am very happy to find out that the memorial re: 1917 Zeppelin bomb on Calmington Road is within your gardens. My late Grandmothers family owned the Wet and fried fish shop that was completely destroyed, killing her Mother, younger sister and her brothers girlfriend a cousin and his girlfriend. My gran was 11 years old and her sister only 7. I am hoping to travel to see the memorial very soon. We would love to talk to you. The Council has commissioned an artist to make a new memorial. Details TBC. Feel free to contact me or Andrew Pearson below. We’d love to hear yours too! And do you have photos? Have you visited recently? What do you think of the cleaned-up aspect now? I lived at no.1 with my parents and three sisters until I married. Have been back once many years ago and saw the fantastic difference that has been made since we were children.